New York graphic designer and artist Tristan Eaton is hosting ThunderVote, today’s site of the day, urging voters to turn out for the US Elections, with the tagline, Don’t be Stupid. Show Up and Vote on November 4th. ThunderVote takes its name from Thunderdog Studios a creative agency and toy brand founded by Eaton in 2003. The goal of the “Thundervote” site is to encourage voter turnout among 18-35-year-olds, with a bias towards electing Barack Obama. 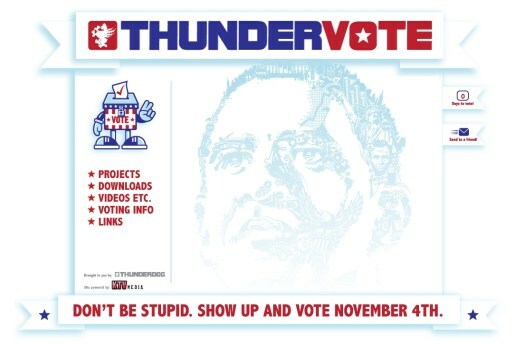 Thundervote offers jpg images from Eaton’s Obama artwork, a downloadable Ballot Box Dude, videos of his Vote for Change campaign, voting stats for key swing states and links to various Obama-themed web destinations. The site includes four YouTube videos encouraging the Barack Obama vote, including one by Tristan Eaton featuring the Ballot Box Dude in Times Square. The ThunderVote website was developed for Thunderdog Studios by KTV Media.